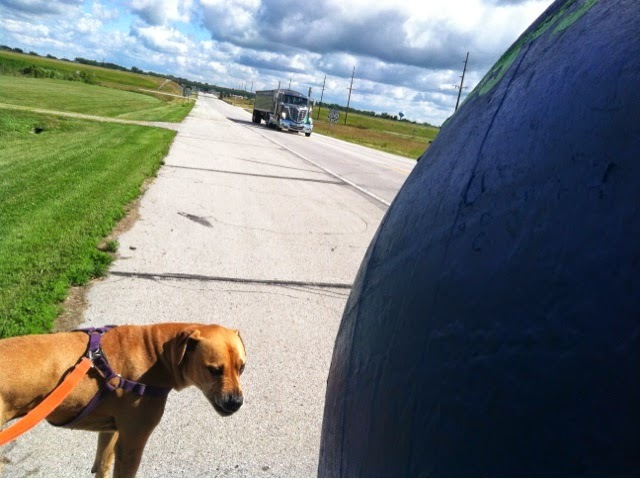 The new 25 , The Hoosier Heartland Highway, from Lafayette to Logansport, cuts a path around all the Heartland towns like a serpent. A wide swath across the heartland that cuts the Main arteries of the hamlets as it detours with a wide four lane divided highway and broad emergency lanes ( Great for me. In the long run not so good for the economy of the heartland's small town.) lined by fence to keep the wildlife from crossing. The old 25, now chopped in pieces. It's villages like fillets that time may soon digest to memory. Buck,Creek, Rockfield, Burrows. 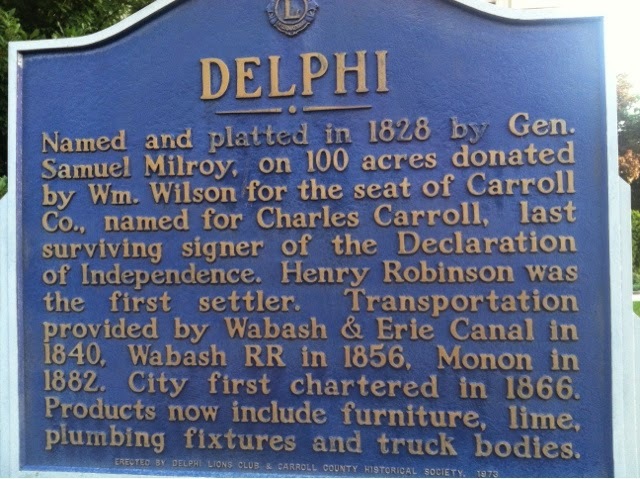 Even Delphi may soon have less population than the cemetery has headstones. This is only opinion, progress has a deeper cost long into the future. I started my day from Fulton with breakfast. I ate at the Liar's table at the eatery where the local men gather to contemplate the World's issues. The topic was the rain of the previous evening and where the honey bees had gone. One said the population was forty percent of what it had been. Another reminisced of being chased as a child from a honey tree by a swarm when he was coaxed to get a handful of honey by his adult uncles. I have never seen a honey bee tree and I am only twenty years the man's junior. He had a few stories of great swarms of bees but lamented they swarm no more. On my way out of Fulton a man stepped from his yard to talk he recommended I look for an Historic Marker ahead that showed the beginning of the forced migration of the indigenous people by our government to the Kansas territory long ago. 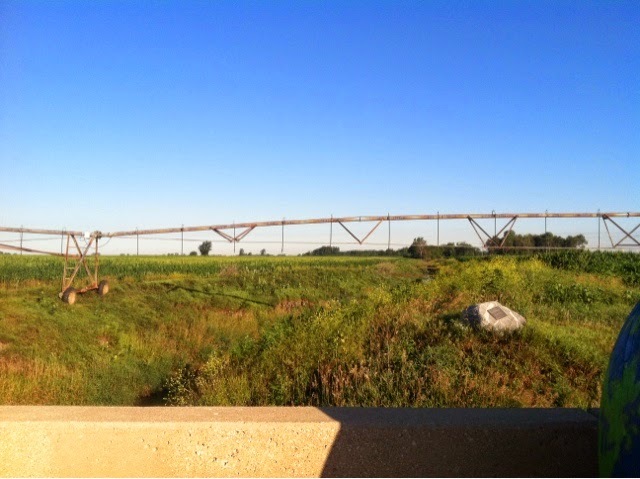 The marker was behind a guardrail next to a creek now obscured by GMO agriculture and irrigation system pipes. Old farmers ask where the bees have gone. 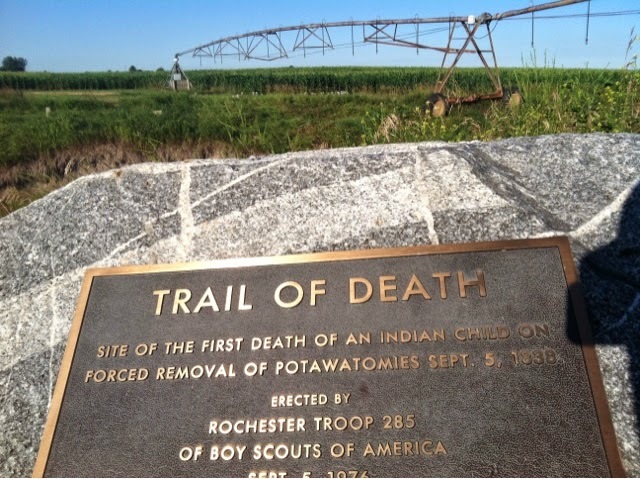 Gone the way of the Potawatomi people, a stone marker with a metal plaque. Or the old 25, a dead end road fenced with barbed wire. Enough of the soapbox. Michigan! He we come! I saw him on Monday mid morning. I was driving home from Etna Green. I wanted to stop and talk to him but there was toad construction. I pass this theater every day at least 2-3 times a day. 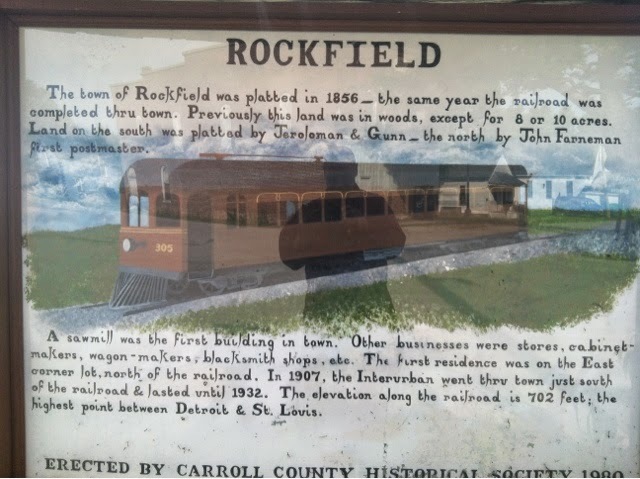 It makes me so sad that the last thing this town had to offer for recreation is now closed. 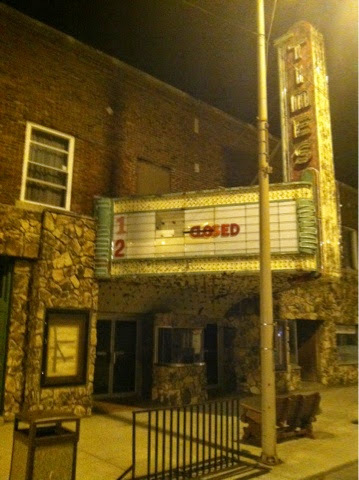 The marquee has looked so weathered and worn for years, but it only closed this past January. (2014).